Brigadier General Murray A. Hansen was born in Seaford, Delaware, attended Marist High School in Atlanta, Georgia and graduated from Lake Forest High School in Illinois in 1979. He worked on the Chicago Board of Trade, prior to attending Westminster College and the University of Kansas, and then entered the Air Force in December 1983. The then Airman 1st Class Hansen worked for the 475th Weapons Evaluation Group, under Brigadier General Charles Horner, at Tyndall Air Force Base, Florida. After completing 18 months of a 4-year commitment, General Horner released him to the Air Force ROTC, to complete college and return to fly. He completed a two-year ROTC program at Detachment 172 and received a bachelor’s degree in Psychology from Valdosta State University, Valdosta, GA in 1987. General Hansen completed Squadron Officers School in 1996, Air Command and Staff College in 2000, Air War College in 2005, Joint Professional Military Education in 2010 and a Master’s Degree in Management and Leadership from Liberty University in 2012. In July of 1987, Brigadier General Hansen started Undergraduate Navigator Training at Mather Air Force Base, California. He received his training with the 452nd Flight Training Squadron and graduated in April 1988. He was assigned to B-52s and completed IQT training, with half the number of normally required sorties from the 329th Combat Crew Training Squadron, Mather AFB, California. His first assignment was the 62nd Bomb Squadron, Barksdale Air Force Base, Louisiana. General Hansen arrived at Barksdale Air Force Base in January 1989. He accomplished MQT training at the Nellis Red Flag Range, was immediately upgraded to Instructor Navigator and placed on the Squadron’s Tactics Crew. In his first year at Barksdale AFB, he was selected as lead navigator of numerous Higher Headquarters Directed missions which validated new profiles, targets and reinforced NATOs understanding of the conventional bomber’s European mission. He was a member of the only dual-qualified B-52 squadron, maintaining simultaneous qualifications in both nuclear and conventional weapons. During Operation Desert Storm, General Hansen flew as lead navigator on eight of eleven combat missions, dropping over 340,000 pounds of ordinance, and was submitted for the Distinguished Flying Cross. He was one of the first aircrew trained in launching the new HAVE NAP stand-off weapon system, developed by the Israelis. In 1991, he upgraded to radar navigator ahead of his peers and completed the program in minimum time. Brigadier General Hansen was selected as the 2nd Bomb Wing’s Public Affairs Representative for being the most active volunteer in briefing the local and regional civic organizations on the role of the 2nd Bomb Wing during Desert Storm. He was also instrumental in developing procedures to host Russian inspection teams, as a result of the Strategic Arms Reduction Treaty. During his tenure at Barksdale AFB, the 62nd Bomb Squadron was awarded the “Best Conventional Squadron in SAC, and the 2nd Bomb Wing was awarded the Omaha Trophy for the Best Wing in SAC for 1991. From 1 January 1993 to 30 January 1996, General Hansen had a break in service where he affiliated with the ranks of America’s entrepreneurs by opening two restaurants in Savannah, Georgia. Seeing the opportunity to return to military service, he then joined the Georgia Air National Guard’s 116th Bomb Wing, 128th Bomb Squadron, on 31 January 1996. He was the Distinguished Graduate from the B-1B Initial Qualification Training (IQT) Course 96-04 and rated exceptionally qualified during his initial qualification flight evaluation as a Weapon Systems Officer (WSO). During the next three years, General Hansen served as the Assistant Chief of Training followed by the Chief of Scheduling. He coordinated all training activities for Unit Training Assembly weekends, was a key member of the Mission Planning Cell, helped develop the Squadron’s Aircrew Verification program, implemented the Unit Level Advanced Planning program and developed the Unit Readiness Briefing given to the Inspector General during the Operational Readiness Inspection. He was upgraded to Instructor and selected as lead WSO on several high profile deployments. 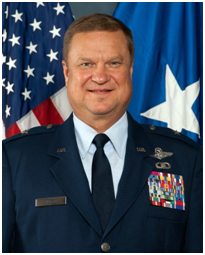 In 2000, General Hansen took over as the Chief of the Wing Operations Center, serving as the Wing Commander’s representative to the Air Logistic Center’s Battle Staff. He was the focal point for the Strategic Arms Reduction Treaty inspections and reporting office for Robins AFB, gaining the “best seen to date” distinction from an actual Russian inspection visit. Under his leadership, the WOC received the highest Command and Control rating (Outstanding) given to a Wing during a Phase 1 ORI. In October 2002, Brigadier General Hansen was assigned to the 116th Air Control Wing, Robins Air Force Base, GA, the first Total Force Blended Wing and largest Wing in the Air Force. He accomplished Air Battle Manager IQT in 2002 at the 325th Air Control Squadron, Tyndall AFB, Florida and then deployed twice in support of Operations Iraqi & Enduring Freedom while serving as the Assistant Director of Operations, then Chief of Staff for the 128th Airborne Command and Control Squadron. He was then selected as the Director of Operations for the 116th Operations Support Squadron. In September 2005, General Hansen was selected above his peers to serve at the State HQ level as the Director of Staff, Georgia Air National Guard located at Dobbins Air Reserve Base in Atlanta, GA. Then from February 2008 to March 2011, he served as the Commander, 116th Mission Support Group, 116th Air Control Wing, Robins AFB, GA. From April 2011 to April 2015, he served as the Air National Guard Advisor to the Commander, Headquarters Air Force Reserve Command. In April 2015, He was promoted to Brigadier General and assigned as the Chief of Staff – Air, Wisonsin Air National Guard. General Hansen is a past President of the National Guard Association of Georgia and currently serves as the Secretary of the National Guard Association of the United States’ Board of Directors in Washington, DC. Brigadier General Hansen is a Master Navigator, Air Battle Manager and Commercial Pilot with more than 3,200 hours in the B-52G/H, B-1B, E-8C and numerous general aviation aircraft. His service medals include the Legion of Merit, Meritorious Service Medal, Air Medal, Aerial Achievement Medal, Air Force Commendation Medal, Combat Readiness Medal, National Defense Service Medal, Armed Forces Expeditionary Medal, Southwest Asia Service Medal, Global War on Terrorism Expeditionary Medal, Global War on Terrorism Service Medal, Nuclear Deterrence Operations Service Medal, the Kuwait Liberation Medals from Saudi Arabia and Kuwait and the Georgia Medal of Valor for Heroism. General Hansen is married to the former Sharon R. Fowler of Moultrie, Georgia. They have three children with another due in Sep 15: two daughters, Holly and Haley, one son Quinn, one grandson Larson and two granddaughters Graysen & Caroline. His off-duty interests include general aviation/flying, real-estate investments, art/antiques/auctions, golf, hunting and horseback riding.